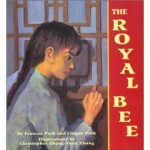 Based on the Park Sister's grandfather's true story, The Royal Bee is an elegantly written tale that pays tribute to a young boy's courage and strength of character. Song-ho is a young Korean boy destined by birth to a life of poverty. Barred from going to school--only the sons of wealthy families could attend--he dreams of learning to read and write. Then one day he hears the sound of a school bell and follows it deep into the valley. There, the school master turns him away, but Song-ho's boldness and determination earn him a chance at gaining an education nevertheless. Dramatically illustrated with richly textured oil paintings, the story offers glimpses of daily life in Korea a century ago--for both the rich and the poor.